The story in a second: So thin you can see through it. 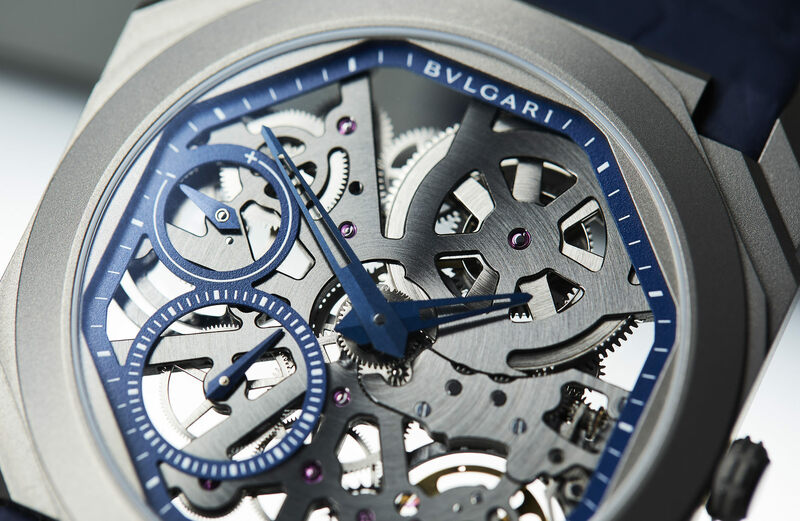 If you were to summarise Bulgari’s approach to design and modern-day watchmaking, the Octo would be the result. In less than a decade, the Italian manufacturer has turned a single striking case design into an entire collection, evolving with each new model, and breaking records left, right and centre. 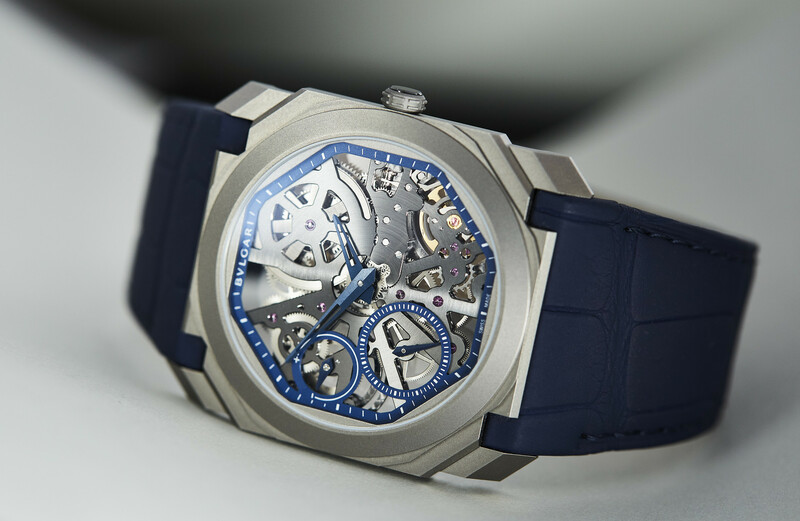 One of this year’s newest additions is the Octo Finissimo Skeleton Titanium Blue, and although it’s not exactly a record-breaker, it does not disappoint. What more can I say about the case of the Octo Finissimo that we haven’t already said? It’s thin (boy, is it thin! ), but slenderness is not the only thing; it’s about the entire package. This Skeleton’s lines are sharp, gliding across its barely there profile like skates on ice. 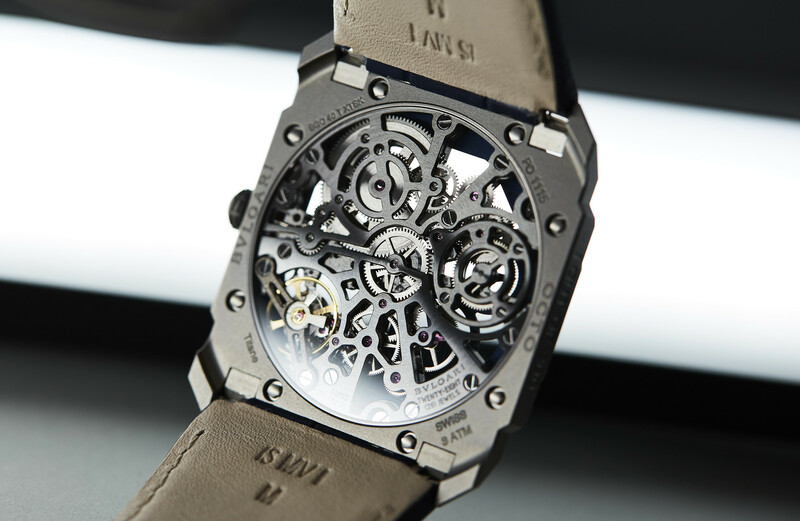 Only that ice is sandblasted titanium, and there’s no mixing of finishes to dazzle and distract; instead it’s all left to the case’s multiple facets and angles to impress – and impress they do. Here, the 40mm Octo case is also slightly thicker than the record-breaking Octo Finissimo Automatic – 5.37mm compared to 5.15mm … to put that in perspective, however, that’s less than two stacked pieces of paper. 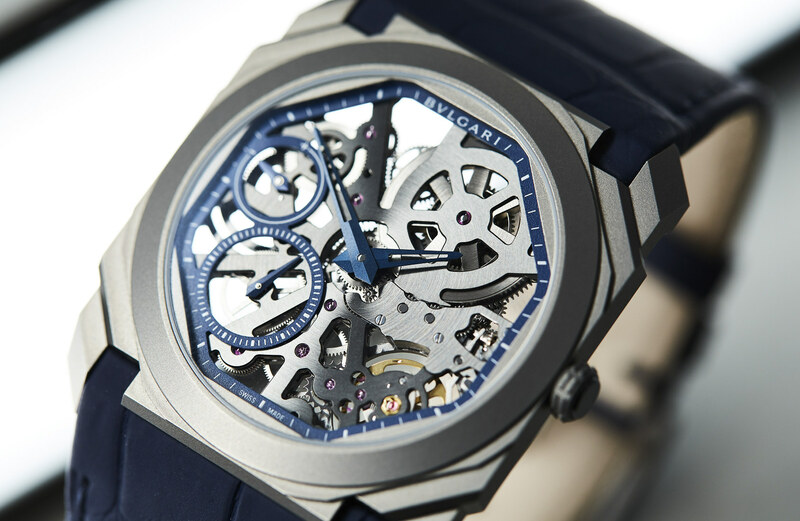 Any discussion about the Bulgari Octo Finissimo collection must inevitably begin with the case; however, when that Finissimo is a skeleton, the dial (or lack thereof) is equally as impressive. The case’s striking architecture is only intensified by the geometric bends of the openworked movement that is now on display where a dial once was. Framed by a matt blue outer ring for the minute scale, and accented by rings of blue that make up a dial-side power reserve indicator and a small seconds subdial, with each neatly stacked off-centre of each other, creating a distinct asymmetrical look that only complements the movement’s bridges. That same blue is then found on the faceted and hollowed out hands for the hours and minutes, capturing the light as best they can for that extra degree of legibility. The star of the show is the BVL 128SK. 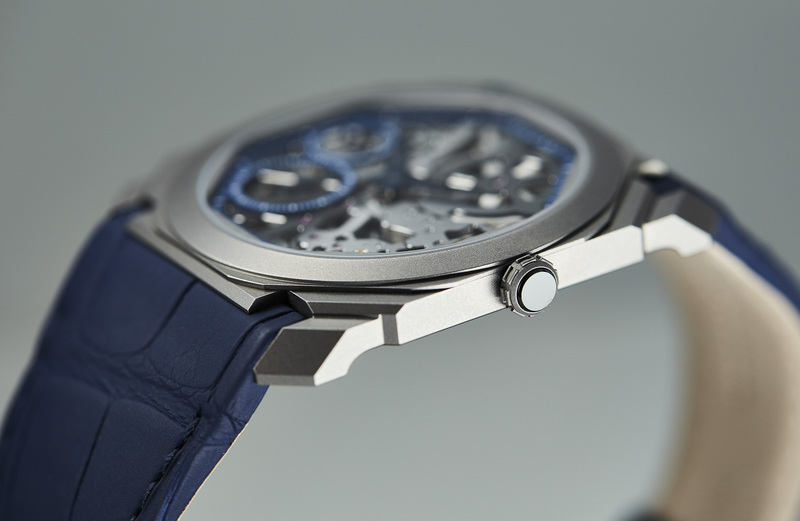 An extra-thin – 2.23mm – manually wound calibre with a 65-hour power reserve that’s based on the BVL 128. Not a new movement, for the Octo Finissimo Skeleton, the original BVL 128 has been streamlined to only the essentials, leaving its small seconds display in play while switching its power reserve indicator from the back to the front. It’s this small but practical change that also adds those few extra tenths of a millimetre to the thickness of the case. There’s a delicate nature that’s normally associated with ultra-thin watches, but I’ve always found that Bulgari’s Octo Finissimo collection does a good job of removing any feeling of fragility. They truly feel like no other watch to wear, and it’s always a joy to strap one on. 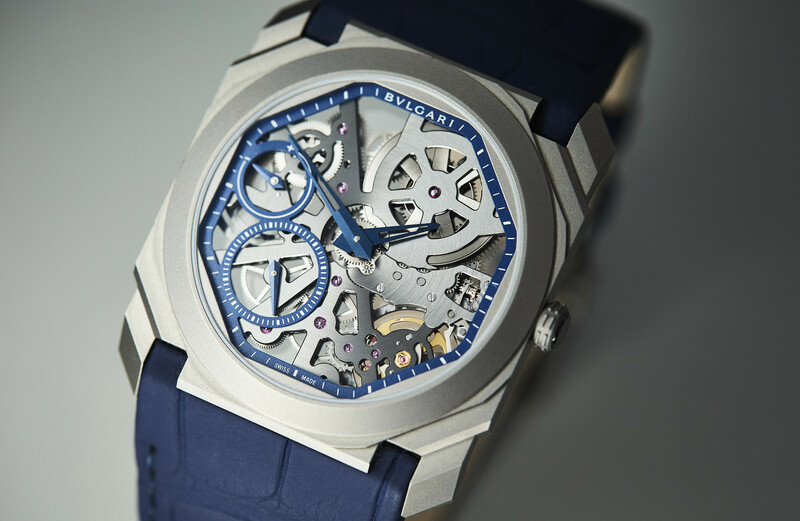 The Skeleton is no exception either; it’s both powerful and modern, while remaining elegant. It’s also – like any other Octo Finissimo – strangely comfortable to wear, but only strange in the sense that the case’s bold looks and sharp edges should not by any means sit so gracefully on your wrist, yet they do. It’s a feeling that is only matched by the lightness of the entire watch as a whole, a sense that in many ways what you are wearing on your wrist is an iconic design that can also tell you the time. I’ve said it before and I’ll say it again: Bulgari’s Octo Finissimo collection must be seen to be believed. And this latest addition is no exception. The way the circular brushing and chamfered edges of the movement’s bridges and plates play with the light, or the way by which simply flipping the watch over somehow opens up the movement even more. For me, this one was a standout hit from Baselworld this year. My watch is so thin you can see through it. Lovers of architecture, ultra-thins, skeletons, or anyone looking for something just a little outside the norm. Personally, although I’m sure I’m not alone, I’d prefer if the hands were solid, or at least filled with a little extra contrast. Just to make the dial that little bit easier to read.